No, this is not a repeat. If you think you have seen a post on Copa Cafe earlier, you are not seeing things. However, this time, I brought the family out to the location in Coquitlam. Actually, Copa was not my original choice. I ended up here because Amorosa was full and it would be over 30 minutes before we would get a table. I have no problem with that; but my kids might. Not sure if the diners there would like to see 2 kids bouncing off the walls for 30 minutes. But honestly, when we leave a restaurant to avoid a lineup, we end up wasting the same amount of time going somewhere else. It could be that I just hate lineups! I dropped Viv off at Zeller's to return something, so I headed over to Copa first with my son. As I pulled up to the front of the restaurant, everyone at the window just had to look over and stare. Is it just me or Asian people like to stare for no apparent reason? It's just like how when they drive by my house and I'm outside, they have to stare at me. What? Do I have something on my face??? Wait, I'm Asian... I hope I don't stare... No, I just take photos of food and thus, people stare at me. Seeing how we all ordered set menu items at the Vancouver location, I decided to order all Chinese dishes (well, at least HK-style interpreted dishes). 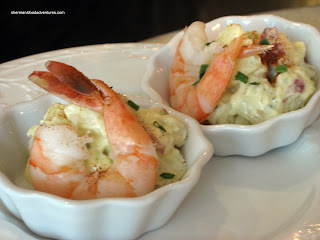 For the kiddies, we started off with Scramble Eggs with Shrimp. This was not an auspicious start to the meal because the eggs were overcooked, watery and in many small pieces. At least the shrimp was cooked right and had the right texture. For good measure, we got the Spaghetti Bolognaise, just in case the kiddies didn't like the eggs. Not resembling an authentic bolognaise of any sort (that's HK-style cafe for you), it was linguine not spaghetti. No matter, the dish tasted fantastic! Lots of meat and cheese flavour and the noodles were not overly mushy. Since it was baked, it had a nice crust on top as well. I just wished they didn't serve it with a big bay leaf in the sauce. I was in the mood for some HK-style curry and selected the Curry Brisket. Although the sauce was flavourful with just a bit a hint of heat, the beef was not very tender. Curiously, this dish didn't come with rice. The final dish is one of our favourites - Salted Fish and Chicken Fried Rice. It's definitely an acquired taste due to the pungent fish; but I gotta tell you, when it's done right... Fortunately, it was not only done right, the dish here at Copa was fanatastic. The rice was firm, there was lots of fish and chicken and the dish was well-seasoned. Pretty predictable meal here at Copa, food was generally good except for the scrambled eggs and the tough brisket. Despite being quite friendly, the servers seemed overworked. We couldn't seem to get their attention when we needed something. One server got bent out-of-shape when she spotted my son playing with the sugar packets. Only in a Chinese restaurant you will find employees scolding others' children. Alright, it was inevitable, Sherman and I were both eating; but in 2 different places simultaneously. What to do? Of course Sherman had his trusty DSLR and was off to Hon's after playing hockey. What about me? Well, I was sucked into doing my very first entry into the blog. Armed with my trusty Canon SD630, I headed off to Adonia with my sister-in-law. Actually, we were planning to go to The Secret Garden; but it was completely packed. I had called Sherman to ask where we should eat in the Kerrisdale area. He was a bit too busy at the time taking off his goalie gear to be much help. He took the opportunity to sneak in, "you should get an iPhone" suggestion. Alright, I really do not have time to be blogging about anything, let alone Sherman's obsessive food adventures. But, he really gave me no choice. We wandered around Kerrisdale in search of a place to eat when we stumbled upon Adonia. Completely empty, we were able to pick where ever we wanted to sit. It was interesting to see that the place was run by Asians. No matter, as Sherman says, it's not important who makes it, as long as it is good. We went in with an open mind. Originally, I sat facing the window which makes for very poor photos. I actually got my sis-in-law to switch seats with me for the sake of better photos. Geez, I pulled a Sherman there... Next, you'll find me moving tables and asking total strangers if I could take pictures of their food! Wait, I'll leave that up to Sherman. He has no shame. Adonia is a quaint little English-style teahouse nestled in the heart of Kerrisdale. Adorned with floral wallpaper and wood paneling; it really has the decor to put you in the mood for high tea. 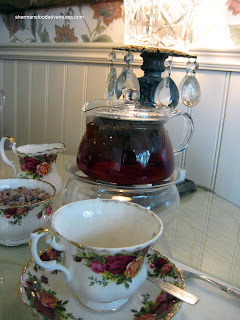 It had a comfy and cozy feel as if I were invited into someone's house for tea. At $22.00 per person, it included choice of tea, Scones, Potato Salad with Shrimp and the traditional three-tiered platter. The platter included mini-sandwiches, hor d'oeuvres and desserts. As we sat waiting, the server set our table with antique teacups, saucers, spoons, sugar bowl, and creamer. I thought this added to the charm of the place. Interestingly, I noticed that the sugar spoon was actually a souvenir from Hell's Gate. The tea arrived first in individual glass teapots and came with a chafing bowl to keep it warm along with a bowl of sugar pellets and cream. I was a little disappointed to see that it wasn't an antique teapot. Anyway, onto the tea. I chose a mango tea and my sis-in-law chose an Earl Grey. I was afraid that the tea would be too fruity and overpowering, but it wasn't at all. It was perfect with just a hint of mango flavour. My sis-in-law noted that her Earl Grey wasn't as aromatic as others she has tried, but surprisingly when she had some, it was quite flavourful. 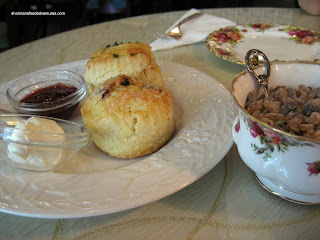 The first of the goodies to arrive were the two sweet and savory scones. The cheese scone had a nice and buttery texture and the raisin scone had a sugary and crunchy top to it. Next up was the three-tiered platter which we worked our way from the bottom up. On that note, no one came to explain anything or checked up on us other than the initial ordering, food service and final bill. On the bottom tier were cucumber sandwiches, ham sandwiches, egg salad and tuna salad sandwiches on mini cheese buns. The sandwiches were pretty standard. Although, the cucumber sandwiches were bland and were in need of a little salt and pepper. The middle tier had 3 different items. A baguette slice topped with green and red roasted peppers and shiitake mushroom, salmon lox on a toasted whole wheat bread, and a puff pastry with salmon mousse. I was looking forward to eating the lox because it's one of my faves, but oh my goodness was the bread toasted beyond chewable! I ended up just eating the lox by itself. The puff pastry wasn't flaky and the mousse was not pronounced at all. There wasn't much of it and I had a hard time figuring out what it actually was at first. By the time we reached the top tier for desserts, I was getting a little full...more from the tea than the food! What I found odd was that on every tier there was two of everything, but on the top a few of the items came as singles. I didn't get to have every piece of dessert since I was getting full, but overall the sweets were again standard. What was nice about them was it wasn't too sugary. 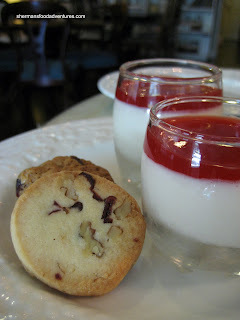 Finally at the end, we were served panna cotta and cookies. I enjoyed the panna cotta except for the sweet jam layer on top of it. As for the cookies, they could have been more creative than serving a walnut shortbread, a cranberry and walnut shortbread, and a cranberry and walnut cookie. 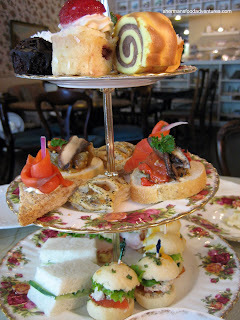 Well, as a first high tea experience it was nice. It was definitely nothing to write home about, but I enjoyed being able to sit for a period of time chatting with my sis-in-law, and enjoying some bites of food. Although this experience has piqued my interest in trying out other teahouses to see how they compare. I'm sure there are better places for high tea out there (Secret Garden and Bacchus). In terms of service and quality of food, I find Adonia just average. Being that this was the last session of ice hockey for the summer at Brit, some of us were gonna head out for eats afterwards. You know me, I am not passing up an opportunity to eat! At around exactly the same time, Viv was at Adonia doing tea with her sister-in-law. 2 blog entries at the same time! For some reason or another, people were having difficulty deciding where to eat. Finally, they all looked at me and figured I should have an idea or two. Taking into account that we had about 10 people including kids, I suggested Hon's. We chose the New West location because it was clos est to where most of us lived. For me, Hon's is a part of my childhood. Back in the day, Hon's was one of the few places where you could get a decent bowl of wonton noodles, congee, whole fried yee mein clusters and of course, potstickers. I remember going to their first, and only location at the time, on Main Street in Chinatown. In fact, we once spotted Tiger Williams dining there, I got his autograph! From those humble beginnings, Hon's has grown to 6 locations including a fusion restaurant. Almost everyone knows about Hon's, after all, it's synonymous with good portions at reasonable prices. But this begs the question, is Hon's necessarily the best considering it's popularity? Universally, I'm sure most people would say it is not the best; but you know what you are getting. It is a safe bet for most people, including those who are not necessarily that adventurous. Let's take the most basic item - the wonton. Although the wontons are perfectly fine at Hon's, it is far from the best in town. I would say that the wontons at Congee Noodle King, Congee Noodle House, Ho Yuen Kee, New Maple and McNoodle are superior in terms of the filling, size and taste. However, I must note that the aforementioned places serve all shrimp wontons. The one at Hon's is the mostly pork with shrimp. Then there is the matter of personal taste. I have some friends who don't like all shrimp wontons and actually prefer the pork with shrimp. Today, everyone had different variations of dishes that included wontons. There was a small Wonton Soup, Wonton & BBQ Pork Rice Flat Noodle, BBQ Duck and Wonton Noodles, and just plain Wonton Noodles. Other than the wontons, there are 2 other components that can make or break wonton noodles - the soup and noodles. The soup at Hon's is actually pretty good, good depth of flavour and not too salty. The noodles have the right elasticity and are visually appealing. All-in-all, a solid bowl of wonton noodles, assuming you like the pork and shrimp type of wontons. The BBQ duck and pork were also very respectable, being quite meaty and juicy. Alright, a visit to Hon's is not complete without ordering Potstickers. These pan fried dumplings come in pork, chicken, beef or vegetarian fillings. Today, they only had pork. I'm sure there are better potstickers to be found; but I do like the ones from Hon's. In fact, I buy them frozen in a bag and make them at home. They have a relatively thin outer skin and just enough filling inside. When prepared correctly, you can eat quite a few of these. I actually prefer making them at home, because they seem to use way too much oil at the restaurant. To be a little bit different, I ordered the BBQ Pork Lo Mein and Yeung Chow Fried Rice to share. Lo mein is essentially dry noodle usually mixed with some oyster sauce and sesame oil. In this case, they took dry to a whole new level. The noodles were so dry and devoid of any moisture that it was stuck in a clump. It had the texture of rubber bands. Even after adding copious amounts of the side soup, it still didn't change the texture. Add to the fact that it had no flavour whatsoever didn't help. At least the BBQ pork was tender and not fatty. The Yeung Chow Fried Rice or BBQ Pork and Shrimp Fried Rice was very good. Packed with crunchy shrimp, BBQ pork, egg and peas, the rice was well seasoned; yet not salty. Moreover, it wasn't oily and the rice itself was perfectly firm. Pretty much another predictable meal at Hon's. Nothing more, nothing less. In my youth, Hon's was THE place to go for this type of food; but with the influx of newer and better wonton noodle restaurants, it's hard to get overly enthusiastic about dining at Hon's. There is absolutely no major problem with eating here; in fact, it's not a bad choice. However, there are better places to go for the same price. Yet, Hon's will be one of those places permanently embedded in my childhood memories. Knowing that I wouldn't be going out to eat until Sunday, I lobbied with Viv that we really should go out for dinner tonight. Reluctantly she agreed, with one condition - we eat Japanese. Having already been to the Sushi Town in Burnaby, we decided to try out their Coquitlam location. As with the Burnaby location, there was a substantial lineup when we arrived. The trick here is to put your name and party size on the whiteboard at the entrance. If you forget to do this, your name will never be called. One thing that struck me about the place was the completely mismatched light fixtures. They have an antique look to them and do not go with the rest of the restaurant. I guess these lights were on clearance? Surprisingly, the wait for a table lasted less than 10 minutes. Too bad we were seated in a corner with little light. I did what I could with the pictures. If you have never been to Sushi Town before, you will be impressed with the portion sizes and prices. However, if you were expecting really high quality Japanese food, you might want to go elsewhere. The food is decent; but it's the value you come here for. We started with one of my favourites, Takoyaki. Soft and fluffy with nice bits of octopus, topped with just enough mayo, bonito flakes and sauce, the takoyaki delivered. Too bad my son didn't want to try it. He doesn't like "things' in this food. Honestly, what food doesn't have things? I guess that's why we ordered a Plain Udon for him. It's not something that I would ever order for myself! The udon was... well... plain, except for a tofu puff, 2 slices of fish cake and sliced button mushrooms. Yup, you guessed it, he only ate the udon. For good measure, we got an Assorted Tempura for the kids. Well, for my son, he'd only eat the tempura batter anyways. At least my daughter ate the carrot and yam. For some reason or another, the tempura was not as good as the Burnaby location. There was just too much tempura batter and some of the pieces were cold. Did they fry some items ahead of time? While we were in line, I saw that the nigiri sushi looked pretty good, so when we decided to get a few pieces. We went for 2 pcs of Unagi, 2 pcs of Inari, 2pcs of Scallop, 2 pcs of Toro and 1 pc of Tamago. With a generous amount of unagi, toro, scallop and tamago, the nigiri was pretty good. I liked how the rice was the right consistency as well. At this point, the constant nose-blowing due to using too much wasabi led to a nose bleed. The lady sitting right next to us kept staring. C'mon, have you not seen someone have a nose bleed before? Let's just say she must be extremely bored to watch someone bleed profusely from their nose while eating sushi! On the topic of bleeding, we also ordered a Red Roll which consisted of scallop and cucumber on the inside and spicy tuna on the outside. Aesthetically, this roll look like someone slapped mushy fish on top of an amateurish roll. Also, there seemed to be too much rice as well. Although it was fantastic value at $4.95, the roll was poorly made and was overpowered by the spicy tuna. For some strange reason, the Spicy Salmon arrived last. By that time, we were quite full. As you can see from the picture, there is a plethora of large chunks of salmon and cucumber tossed in a spicy sauce. Unlike some other establishments, most of the salmon here are not leftovers. This is an excellent value at $7.95. There was so much, we actually didn't end up finishing it. Once again, a pretty decent meal at Sushi Town. Much like the Burnaby location, you get good portions at reasonable prices. In terms of taste, there isn't anything to write home about; but it is more than acceptable. However, both locations suffer from hurried and minimal service. It's not that they're not friendly; but all the servers seem to be running around all time with too much to do. Getting more tea or even paying your bill may take you awhile. Little do people know, my absolute favourite food is the simple French fry. That's right, a unassuming sliver of spud trumps even the mighty lobster. You might be wondering why on earth I would prefer fried potatoes over everything else. Well, think of it. It's portable, easy to eat (I love finger food!) and is essentially a canvas for the addition of flavours and condiments. Not to mention, it's fried! Of course it is destined to be good! After reading Kevin's (604Foodtography) post, I was wanted to try it out for myself. It has taken me so long since then, the place has expanded and renovated. Now you might think French fries are easy to make. Well, they are actually easy to make; but will they turn out right? Something so simple is not necessarily an easy thing to execute. What makes a good French fry? Well, it is indeed personal preference; but I like mine very crispy. Furthermore, it still needs to resemble a potato. Otherwise, what we have are potato crisps. At Belgian Fries, they double-fry their spuds. That's what makes them so crispy. Despite this double dose of oil, the fries do not seem greasy or overcooked. Viv decided to be conservative and merely ordered a small cone of fries with chipotle mayo. Sometimes the simplest things are the best. The fries eaten on their own were indeed crispy with fluffy potato inside. Dipped into the mayo, it was pure pleasure, I could probably eat a whole large cone of these. For myself, I went all out and got the Montreal Smoked Meat Poutine. What you see in the picture is a medium. Imagine the size of the large! Atop the crispy fries lay a mound of cheese curds and no shortage of thinly-sliced smoked meat. A glistening gravy finished it off. I really enjoyed my unique poutine; but the combination of smoked meat and gravy made the entire dish a bit salty. Furthermore, I wish the cheese curds melted a bit more. Other than my small complaints, Belgian Fries satisfied my craving for French fries. There were so many choices of poutine, I almost couldn't decide. In addition, they have burgers and fish n chips on the menu at a reasonable price. Although a bit on the pricey end for fries, the quality and quantity makes up for it. On my way back from a truly satisfying breakfast at Cafe Medina, I stopped by Ba Le in Chinatown. No, I wasn't getting some Banh Mi for myself, I'm not that much of a glutton! Rather, Viv had just taken our son out for his swimming lesson and didn't have lunch yet. Normally, I get my Banh Mi fix at the Kingsway location; but it really wasn't on the way home. Honestly, I really don't remember the last time I visited the Chinatown location. It would probably be back when we lived in downtown before kids. Ah, life was so much simpler back then. The Chinatown location is quite a bit smaller than it's Kingsway counterpart. It is considerably more run-down looking after the recent renovations at the Kingsway location as well. However, no one really goes there for the ambiance (at least I hope not), it's the excellent Banh Mi that counts. But, there is a difference. For some strange reason, there were no hot peppers in the Banh Mi. Instead, there was an abundance of pickled onion slivers. Personally, Viv and I didn't like that combination and much preferred the other version better. It's probably that we had to request peppers to get it? Despite that, there was the requisite cold cuts, pate, butter mayo, fish sauce, pickled daikon and carrot and cilantro on a crunchy french roll. At $2.75, this has to be one of the best values in town, especially if you like Banh Mi (is it just me or is it cheaper than the Kingsway location?). Last time while I was dining at Chambar with Whipping Girl, we had noticed Cafe Medina next door. Incidentally, Cafe Medina is operated by Nico and Karri Schuermans of Chambar with former staffer Robbie Kane. It has taken us until now to try it. I just needed to find an excuse to go there. Well, MagMagMug's visit had come to an end and she was leaving tonight back to Hong Kong. Hey, let's do a going away brunch! Originally, TS (eating_club Vancouver) was supposed to join us; but she was just too tired from her gastronomical adventures in NYC. Too tired to eat? What's with that??? So it ended up to be only the 3 of us. When we arrived, I was about to park right across the street from Cafe Medina; but I noticed the special parking restrictions on the meter. I thought better to park the next street over since there was a tow truck taking a Range Rover away and the meter maid standing right across the street ready to pounce. Pretty obvious I should not park here eh? To my dismay, we were seated far in the back of the cafe because the front table near the window was taken. This would mean bad photos! The humanity!!! Ah, no worries, we noticed that the people had left and I flagged down our server and asked if we could move. Whipping Girl was a bit concerned for all the trouble we were causing and thought they would spit in our food. C'mon, they won't do that, we're not in a Chinese restaurant you know! Joyfully, I moved to our new table with excellent lighting. MagMagMug was doing her best Miss Y impression and was fashionably late. It was alright, I wasn't in any rush; but I think Whipping Girl was anxious to get back to work. Just as we were about to order without her, MagMagMug arrived, so all was good. While MagMagMug was looking over the menu, I hinted to her that the Fricasse was their most popular breakfast dish. It was my way of making her order it because Whipping Girl and I had already choose other dishes. With a combination of 2 fried eggs, braised short ribs, roasted potatoes, caramelized onions, arugula, applewood cheddar in a skillet and grilled foccacia on the side, it's easy to be popular. This makes the standard eggs and bacon breakfast look downright boring. I was able to sample a bit of the short rib and it was so tender. Short ribs for breakfast - awesome! Prior to the Fricasse, we all had one waffle each. Hey, you can't have breakfast at Cafe Medina and not have a Belgian waffle! Well, that's the play I used on MagMagMug anyways. The girls opted for the Mixed Berry Compote with their waffle and I settled for the White Chocolate Pistachio (since Fig Orange Marmalade was out). Let me say that I'm not much of a waffle person; however, I really liked this waffle! Warm, soft, slightly sweet and crisp; this waffle would be great for snacking alone. I preferred the berry compote more than my chocolate pistachio. It was too sweet and didn't have much pistachio flavour. The compote had a nice tartness to it. Whipping Girl already picked out her meal the day before (that's some type of planning) and it happened to be La Sante. Presented on a large platter, the deconstructed breakfast consisted of a soft boiled egg, vine ripened tomato, avocado, prosciutto, extra virgin olive oil and grilled ciabatta. It was a great array of textures and flavours from the salty prosciutto, smooth avocado, crispy ciabatta to the delicate egg. My choice was the Cassoulet which consisted of 2 fried eggs on baked beans, saucisson de Paris, double smoked bacon, andouille and grilled foccacia. This breakfast made me a happy man. I had baked beans, 3 types of meat and fried eggs. How could I not be happy? It was so savoury and rich in flavour, I actually ate all the onions (despite my issues with them)! What makes Cafe Medina special is that it's no ordinary breakfast. Combined with the delectable waffles, the savory and filling breakfasts have a certain "wow" factor. Combine that with a really quaint dining room and friendly service, who wouldn't want to have their first (or second) meal of the day at Cafe Medina? With our softball season officially over, naturally, the only way to mourn the loss of eating out every Monday night was to... eat! With 16 people in all and a few kiddies, options were limited. Compounding the problem was location since it had to be central to everyone. Nick's Spaghetti House popped into my mind and everyone seemed receptive to the idea. However, in the end, I'm not sure if it was the best choice... But more on that later. Miss Y indicated that she would drive to my place and hitch a ride off me. Naturally, she arrived late and dressed like she was just about to sashay down a catwalk. She was definitely over (under?) dressed for Nick's! Unfortunately, Nick's does not take reservations, so we had to wait for a table. Ranger and Ketchup had arrived first and the server was a bit shocked at the request for a table of 16. Luckily we didn't have to wait long. Honestly, I've never eaten at Nick's because the outside looks rather run down. Well, the inside is not much better. It looks like they kept everything from when it first opened 52 years ago. It definitely reminds me of restaurants during my childhood in the 80's. However, one look at the menu and the prices are definitely nothing like the 80's; in fact, they seemed rather high. Nothing appeared to be under $15.00. Alright, I'll play along here, maybe the portions are large? Yes, the portions are quite good, I can't deny that. But what about taste and presentation? Now this is where it gets downright controversial. I ordered the Combination Dish, which included Ravioli, Spaghetti, Meatball, Mushrooms and Spareribs. Sounds like a lot of food right? Yes, it's a good amount of food; but was it worth $20.00? Okay, you look at the picture and what do you think? For me, just by looking at it, I would say it's not worth $20.00. Wait a minute you say. What about the flavour? Sometimes really good food is worth any amount of money because it's a taste experience to last a lifetime! To me, the taste was definitely associated with my lifetime; but way back in the 70's! Yes, that's how pasta was served and tasted like when my age was in single digits. The pasta was overcooked and the sauce was something that reminded me of summer camp. To be fair, it wasn't terrible, but the sauce lacked any complex flavours, being one-dimensional (quite tart). However, I did like the meatball, it was large and moist. The spareribs were tender; yet the sauce destroyed any other distinguishing taste. I must mention that some people like this style because it's not oily. Viv and Miss Y both had the Gnocchi with Meatballs. Again, Viv thought the meatballs were quite tasty; but the gnocchi was quite dense and doughy. Furthermore, the very same sauce did not improve the dish. It didn't end there, every dish that arrived came with the same red sauce. Judes had the 1/2 rack of BBQ Ribs with Ravioli. The ribs looked decent and as for the ravioli, the ones I had were bland and again, the sauce killed it. Milhouse opted for the Veal Cutlet with Ravioli. The large veal cutlets looked to be fried up nicely glistening with oil. For the ravioli, I'm sure you get my drift already so I'm not going to comment on it any further. Mr. Blueberry went for the mother of all dishes and had the Large T-Bone Steak with Ravioli. Man, we're not really original eaters are we??? The steak sure looked impressive; however was quite tough. Gadget Girl and Ketchup both had the Spaghetti and Meatballs. They seemed to enjoy it, so it really depends on personal preference. But again it was the same sauce and the same meatballs. Boss Woman did have something a bit different - Italian Sausage. But nevermind this time or any other time, I didn't get to try it because Boss Woman won't let me have any. Alright, by now, you must be thinking that I totally hated and despised Nick's. Hate is a really strong word and there are not many restaurants that I truly despise other than Po King and Floata. With that being said, I think the biggest problem I have with Nick's is not even necessarily the food. After all, the meats were all pretty decent (except for the steak) and we never got a chance to try any other sauces. Nick's is really ol' school and unrefined; but really, my biggest problem were the prices. It's not cheap to eat at Nick's despite the decent portions. I only say decent, because Ranger and I dusted off the biggest plate they had in the Combination Dish. I was full, but not bursting at the seams. For $19.25, either the food has to knock my socks off or it has to stuff me til I want to puke. It did neither. Remember when I said Nick's causes controversy? Well, they have been in business for over 50 years, so they must be doing something right. There are some people who swear by Nick's and there are those who absolutely hate it. For me, I couldn't erase the comparisons I was making with Boston Pizza. Yes, I couldn't believe it too; but I began to have thoughts that the pasta sauce tasted like the ones at Boston Pizza! I'm sure some people will now leave nasty comments saying I don't know anything and I'm a idiot. But I'm merely sharing my honest opinion. Nick's serves very loyal customers food that they obviously like and hold dear to their hearts; however, I'm just not one of them. - What's with those prices?? ?